Cafe Rene is pleased to offer a number of books for sale in association with Amazon.com, the huge online book retailer known worldwide. Purchases of books through Cafe Rene help support this website! Only ordering a book by clicking on a link below actually counts, though -- if you just go to Amazon on your own and order, your purchases don't count for our site. So click below if you're interested in purchasing! We've already done the digging for you and found the key 'Allo 'Allo books and other books by the creators and stars... but maybe you've got an itch to find books more closely related to World War II? Want some more general British TV books? Just humor books? Then try out Amazon.Com's search box below! A portion of the revenue from all purchases made using this box helps support Cafe Rene! Price: £5.99 (only the British printing is available). Price in US dollars: $12.95. This is a softcover compilation of the two fabulous hardcover volumes listed on the Merchandise Page. 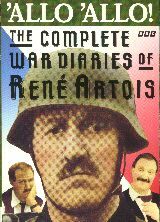 It features the stories of the first five years of 'Allo 'Allo written in "diary form". It's written as a "translation of the diaries of Rene Artois", and chock full of fun little tidbits and pictures of scraps of memorabilia. Click here to order this book at a discount from the regular list price, through Amazon.com! "Listen Very Carefully, I Shall Say This Only Once"
Price: £12.99 (only the British printing is available). An autobiography of co-creator and co-author of the series, Jeremy Lloyd. Chapters deal with many parts of Lloyd's life, including his time on America's "Laugh-In" and his initial teaming with David Croft on the hit series Are You Being Served? Only one chapter concerns itself with 'Allo 'Allo, but it's full of fun little details, like the fact that Arthur Bostrom takes to his "horrid French" accent so well Lloyd can't believe it; or that many jokes in each episode end up being cut out for time. The rest of the book is also a fun read, though a bit disorganized - it seems to be written in a "stream of consciousness" style. List price in U.S.: $12.95. Scripts and stories from this hit comedy series, also by the team of Jeremy Lloyd and David Croft. Contains 16 color photos! List price in U.S.: $4.95. A children's book with religious themes, written by the co-creator of 'Allo 'Allo. by Jeremy Lloyd (co-creator) and Graham Percy. Not much is known of this book except that it has to do with cats, mice, and Christmas. Amazon.com reports the ISBN number and notes that it is hard to find. Amazon.com reports this book is out of print and hard to find, but may be able to locate a used copy..
A Walter Mitty-like man daydreams about being dashing, adventurous, and brave - and more remarkably, he is all those things, while he believes he's Captain Dangerfield. But what happens when the people he loves begin to convince him he's not really all that brave? by Gavin Richards (Capt. Bertorelli). Click here to order this book through Amazon.com! Having nothing to do with 'Allo 'Allo or Captain Bertorelli, this is an adaptation of a mystery screenplay, written by Gavin. England Expects: A musical entertainment for all those sick with sacrifice. Journeyman Press ; Belt & Braces Roadshow Co.
Not much is known of this book; even Amazon.com merely reports the ISBN number and notes that it is hard to find. Also listed above, in "Books by 'Allo 'Allo People"
by Adrian Rigelsford, Anthony Brown, Geoff Tibballs. List price in U.S.: $17.95. Episode Guide, Behind-the-scenes info, interviews with cast & creators, lots of pictures and much more in this huge and thorough book! Click here to order this tape through Amazon.com! List price in U.S.: $16.00. The complete scripts, with photographs, from this classic comedy. List price in U.S.: $15.99 ea. Click here to order vol 1. Click here to order vol 2. Click here to order vol 3. A special radio adaptation of the scripts from this hilarious series, with the original cast. All contain four complete episodes, and all are available at a significant discount off list price through Amazon.com! List price in U.S.: $14.99 ea. Click here to order vol 4. Click here to order the Box Set. Video collections of the original episodes. All contain three complete episodes, and all are available at a significant discount off list price through Amazon.com! List price in U.S.: $20.95. List price in U.S.: $21.95. Click here to order the paperback edition at a discount from the regular list price ($11.95), through Amazon.com! List price in U.S.: $18.95. List price in U.S.: $14.95. The ultimate companion to the ultimate comedy series. Oversized, with episode guides, exclusive interviews, rare photographs and more! List price in U.S.: $15.00 ea. Click here to order volume 1 at a discount from the regular list price, through Amazon.com! Click here to order volume 2 at a discount from the regular list price, through Amazon.com! The complete scripts for the television episodes of the defining series of 1970's British comedy. by Terry Gilliam, et al. List price in U.S.: $14.00. List price in U.S.: $15.95. Exploring the work of the Python members before and after they worked together - includes discussion of such recent films as A Fish Called Wanda and The Fisher King. List price in U.S.: $12.00.